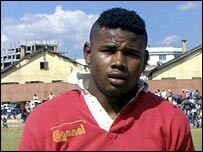 Madagascar is not the first country that springs to mind when you think of rugby. Partly that is because they have never excelled on the international stage. That changed three weeks ago with a surprise 33-31 home victory against a strong South African amateur side, in the semi-finals of the African Top Nine cup. On Saturday, the Madagascar Makis, named after the island's national animal, a species of the legendary lemur, face Morocco in the Top Nine final. The team is rated one of Africa's best, with several players in the French league. Though it looks like a bit of a David and Goliath contest, the Makis have surprised so far. In the game against the South African side, their quick backs consistently broke through a lacklustre defence. About 40,000 people packed into the national stadium to watch. Those who could not afford tickets hiked up to the top of Queen's Palace on a cliff-face that overlooks the stadium to get a bird's eye view. Captain Noe Mboazafy kicked a spectacular drop goal from the half-way line that visibly delighted President Marc Ravalomanana, who turned up especially. "The Malagasy people are really behind us - I think that gives us a good chance," Mr Mboazafy said. "Rugby is more popular than it's ever been." Coach Berthin Rafalimanana thinks the Makis' recent successes were down to a change of psychology. He has been using tales of Madagascar's bloody past to harness their aggression when faced with a rival national team. "I tell them war stories, especially from the colonial period under the French," he said. "There are anecdotes from the liberation struggle which I can use to charge up their aggression to defend their country," he said. This new aggression, added to their already remarkable speed, is what enabled Madagascar to beat Ivory Coast and South Africa in this year's cup. "Any foreign team that faces us become like soldiers attacking Madagascar," he said. "Rugby is like war - you might lose a battle one day, but there'll be more." If that is so, then where are the patriots rallying around Madagascar's cause to be found? A short walk around Antananarivo's burgeoning slums tells the story of where rugby comes from in Madagascar. On this island of 17 million people - one of the world's poorest with three-quarters living below the poverty line - rugby is popular above all in deprived urban areas. 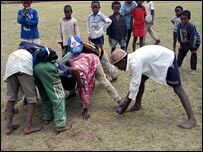 Children in filthy rags can be seen doing lineouts and scrums using a screwed-up plastic bottle as a make-shift rugby ball. They play rough: children as young as five are rarely afraid to get tackled into the hard, dry earth. "Rugby is mostly popular in poor areas because it's a contact sport," said Patricia Rajariarison, a life-long rugby enthusiast. "The elite didn't want to have that rough contact against each other." Ms Rajariarison said that, traditionally, it was only the lower caste of society that played and watched rugby. But this is rapidly changing with the Makis' ascent to semi-stardom. "The people who played rugby were the descendents of slaves," she said. "But that's changing: the rugby team is doing so well, whereas in the football, Madagascar didn't even qualify for the Africa Cup of Nations." National Rugby Federation board member Tina Lalaina thinks a win against Morocco in France in the final could prove inspiration for Antananarivo's poor. "It's a dream for them," she said. "Every player in the Makis is a star in his home quarter. [The children] are so proud of these players." 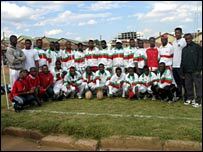 As well as getting used to near-freezing temperatures of the Paris winter, Madagascar will have to play a team whose speed and technical prowess has already got them into the final five times before and won it for them in 2003. But full-back Hary Nirina thinks it much depends on the day. "Each team has their strong and weak points. Our strong point is our speed: we run quickly, both the forwards and our backs," he said. "Our weak point is that we're too small. The Moroccans play that French style of rugby and are very confident. But I think we can still show them a good game."